Despite the high rate of moisture in the air on Saturday I decided for the latter. Pretty strange to be dumped from the bus Tampere-Turku right in the center of nowhere - a crossing, woods, meadows, a bus stop sign, some other traffic signs, that´s it. The street to Rämsöö could be defined as high-standard field path through an appealing landscape, woods, fields, horses, a brook, a bridge and sometimes even houses, indeed there are people living here... after half the distance I really appreciated somebody stopping and offering a soaking wet hitch hiker a ride to the local summer theater/festival area. I took the chance to take snap shots of all those "instruments" spread in the setting for "Ronja, the Robber´s daughter" (check the photo gallery). No tricks, no fake, just microphones, everything live. Well, wrangler or circular saw I could easily identify, also a steam engine, the original purpose of other gears is still a mystery to me. The idyllic natural arena at a sea shore filled up in no time, and even extra seats were needed, although the weather had not improved. 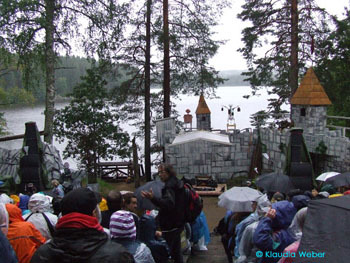 It wasn´t raining heavily, yet steadily... nevertheless, the spirits were high. 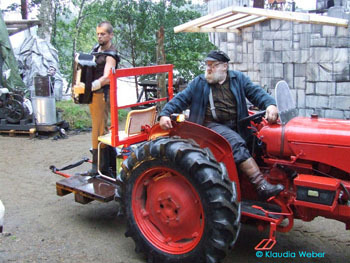 Kimmo Pohjonen came to stage by tractor, and I can only try to describe what followed, as not only this musician but also this concert have to be put in their own category. Words are not enough... simply "real heavy metal", just like a festival T-Shirt announces. 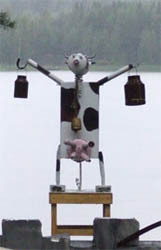 Various machines did not only deliver the rhythm part or background sound, Kimmo used samples he had recorded before, of machine noises or other farming sounds. His totally re-constructed instrument can rather be defined as synthesizer than as "classic" accordion (read details in the interview here ), his style mixes Rock, Jazz, Folk, Klassik, Trance - or something. I can only recommend to check his videos on his homepage or on YouTube and to find your own definition. 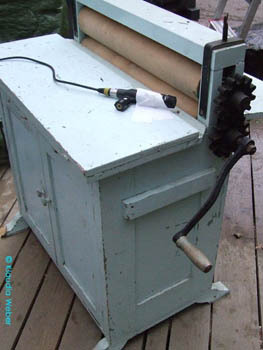 It began in a rather traditional way, first a sharpening machine, later a chain- and a circular saw, operated by local experts, functioned as rhythm machines. 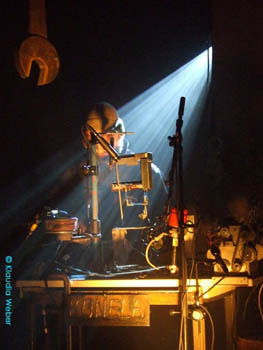 Kimmo used the live sounds but also samples, improvised with various themes and samples and used also his voice as additional instrument. The overall effect - fascinating and hypnotic. Indeed a symphony, where "instruments" worked together but also had their "solo" parts. Then problems to start an engine, first just as acoustical (sampling) gag, but then indeed the steam engine required more than one set of hands to get it working and spitting black smoke. 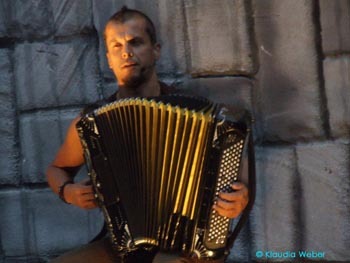 Who wasn´t amused yet - Kimmo also had pig grunt samples, not played with it but also tried very hard to reproduce those noises himself, and the accordion was turned over and became a percussion instrument... indeed a show full of surprises, not only musically. Nothing like a "classical" concert, and at least two of those songs would have inspired a headbanging crowd. 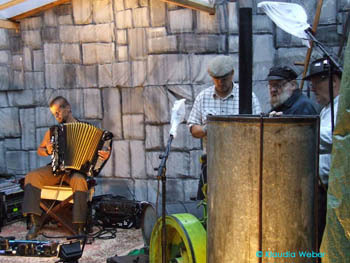 Still in between there were calmer moments with rather traditional Folk-pieces from a conventional accordion repertoire. 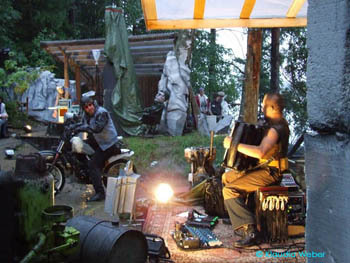 Finally a highlight - suddenly a motor bicycle roared on stage, and we heard a wrangler - bike - accordion trio. No wonder that the applause lasted for a long time after this 1-hour spectacle. 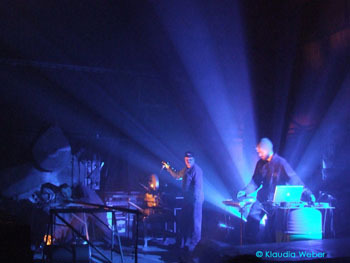 Konela (Samuli Kosminen, Percussion, Synth & Jukka Perko, Saxophone) played in an industrial machine hall and worked with the same basic idea (and their concert is also pretty difficult to describe): Live operated machines from the metal industry, e.g. 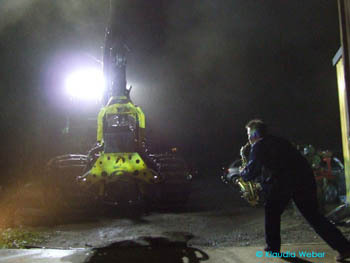 a welder, plus samples of their sounds, combined with live music, this time a Sax and a Synth, or machines turned into percussion instruments. A stunning light show effectively enhanced the impact of the performance. At this point again a big thanks to the very friendly and helpful festival crew, and also to Paulina and Heli - thanks for the ride!